You can’t say that the Colorado state legislature has never done anything good. 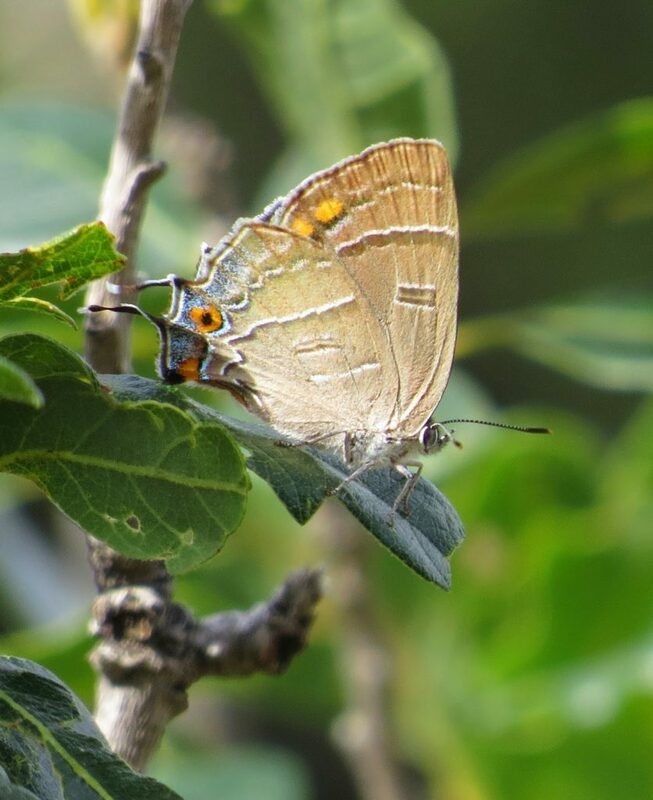 Back in 1996 it passed a bill making the Colorado Hairstreak, Hypaurotis crysalus, the state insect. Heidi and I finally got to see this magnificent butterfly this past Monday, August 18, in North Cheyenne Cañon Park here in Colorado Springs, after looking in vain for the last 3-5 years. 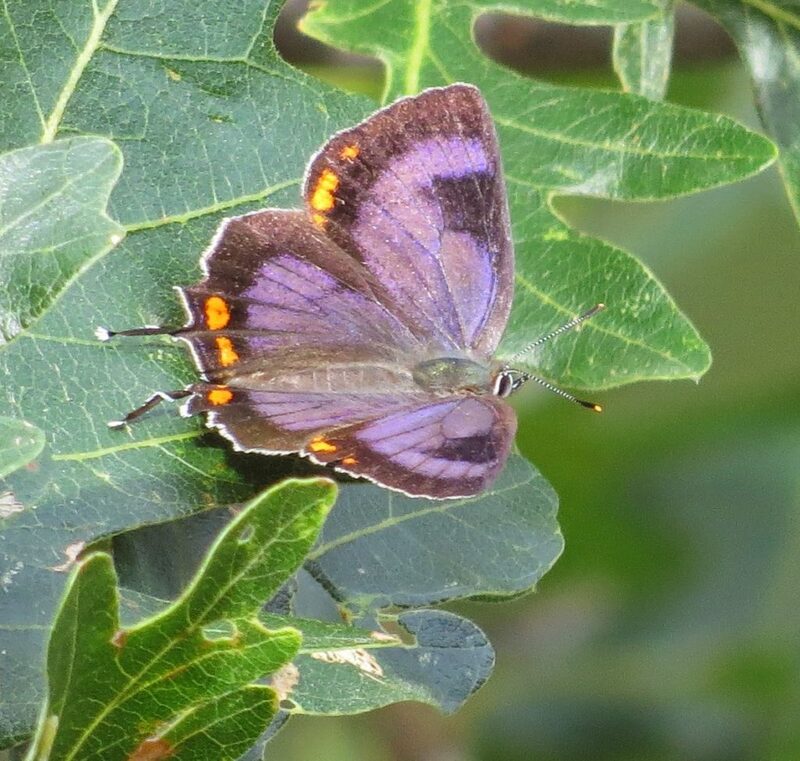 Just why this insect is so elusive is something of a mystery to me, though we noticed that the butterflies favored healthy oak trees free of most galls and other signs of weakness. The Gambel’s Oak, Quercus gambeli, is the host plant for the larva. 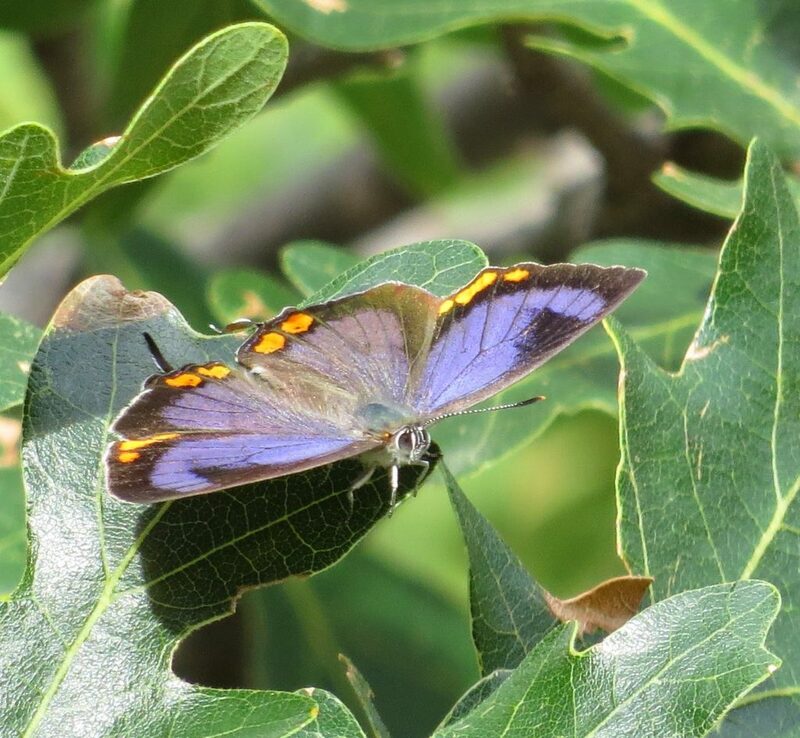 The oak is widespread at elevations from about 6,500 ft. to 7,500 ft., so the butterflies should be equally abundant one would think. These are fairly large butterflies for members of the hairstreak family Lycaenidae, with a wingspan of 32-38 millimeters. They normally rest with wings closed, and their dull gray underside, striped with white and brown lines, a little orange and blue trim, make it easy to overlook them. When they open their wings to bask, however, they reveal their full glory. The dorsal surface of the wings is largely vivid purple, with black margins and a black patch or band on the forewing. Bright orange spots along the edges, and delicate “tails” on the hind wings add some pizzazz. 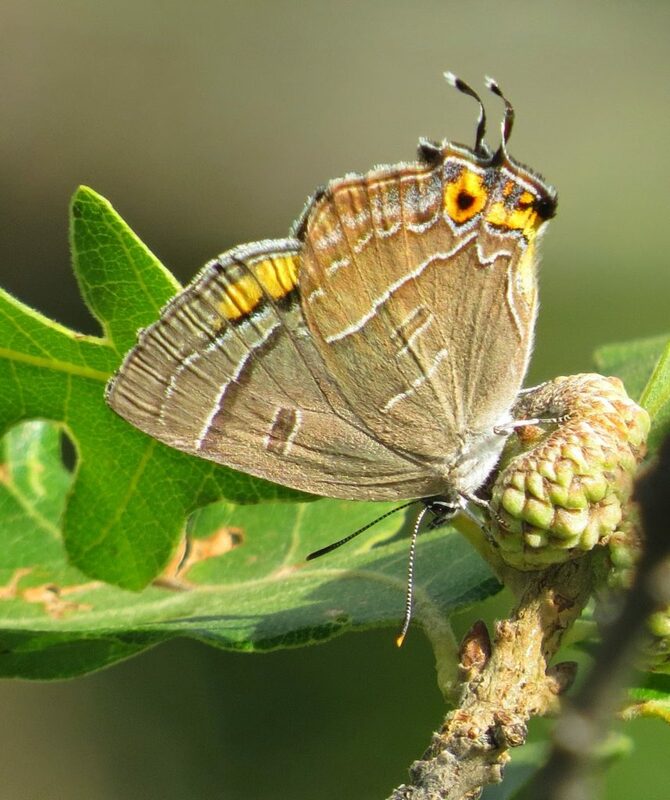 Males, like most hairstreaks, are territorial and will defend a given oak tree from rivals. We witnessed several instances of one male chasing another on a south-facing slope in the park at an elevation of slightly more than 7,000 ft. This species rarely, if ever, visits flowers for nectar. Instead, it feeds on fermenting sap from wounds in trees, on the exudates of developing acorns (see image above), and on the honeydew secreted as a waste product by aphids and scale insects. The larval stage of the butterfly is yellowish green, slug-like in form, and exceedingly cryptic. We may want to go looking for that stage next spring to complement our images of the adults. In late summer and fall, the female butterflies lay their eggs individually on branches and twigs of the host tree, where they overwinter. The caterpillars that hatch then consume the new oak foliage as it develops. The story of the rise of this butterfly to the status of State Insect involves the usual lobbyists: School children. In this case, it was thanks mostly to the fourth grade class of teacher Melinda Terry at Wheeling Elementary in Aurora, Colorado. There is but one generation of this butterfly annually, and while specimens have been recorded from May to November, they reach peak abundance in July and August. Besides Colorado, this insect is found in Utah, Arizona, New Mexico, the southeast edge of Wyoming, and extreme eastern edge of Nevada, barely inching across the border. The “type” specimen, from which the species was described, was collected at Palmer Lake in El Paso County, Colorado (just north of Colorado Springs), in 1873. At least, that was the year of publication of the description, by W.H. Edwards. Look for the butterflies to be active even on cloudy days, and right up until dark. Indeed, we encountered them after a thunderstorm skirted the Seven Bridges Trail in the park, on our way back to our car. Sources: Brock, Jim P. and Kenn Kaufman. 2003. Kaufman Field Guide to Butterflies of North America. Boston: Houghton Mifflin Company. 384 pp. Cranshaw, Whitney and Boris Kondratieff. 2006. Guide to Colorado Insects. Englewood, Colorado: Westcliffe Publishers. 232 pp. Ferris, Clifford D. and F. Martin Brown. 1981. Butterflies of the Rocky Mountain States. Norman: University of Oklahoma Press. 442 pp. Lotts, Kelly and Thomas Naberhaus. 2014. 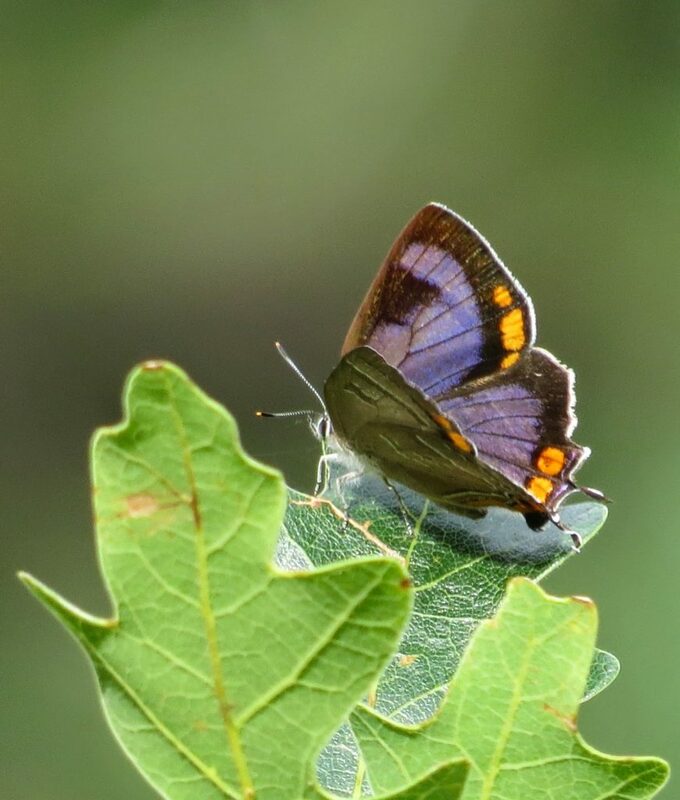 “Colorado Hairstreak,” Butterflies and Moths of North America (BAMONA).